Whoa! Is it August already? That leaves me scant little time to big up this little event I’ve wanted to get happening for a while now. A couple of years ago, I stumbled across a great event that first took place on Wray Avenue way back in 1896, when it was then called Hampton Street, of course! 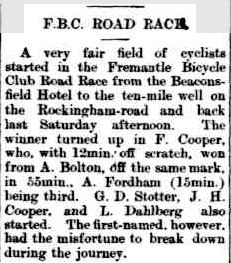 The event was a bicycle race, coordinated by the Fremantle Bicycle Club. It was a 17.5 mile (28 kilometre) return run from Beaconsfield Hotel (now Moondyne Joe’s Hotel) to the ten mile well, now the site of the Ten Mile Well Hotel, on Rockingham Road in Wattleup. I’ve read a lot about Fremantle’s love affair with the bicycle over a hundred years ago – something we are fortunate enough see happening again these days – and thought it’d be great to revive this race which ran up until the first world war. My vision is for more of a social ride rather than an all out race that gives everyone in our community an opportunity to participate – although the speediest are welcome to try to beat A. Bolton’s original time of 55 minutes return to Ten Mile Well! I’ve planned out three routes for different levels of cycling ability. With a race schedule to wrap up about midday, I’d love to have a street barbecue afterwards, some fun awards and possibly even some live music to celebrate the start to Spring. I’d hoped to get it together for the first Saturday in Spring but that clashes with the election, so I’m pitching for Saturday the weekend the following week – September 14. Feel free to post here if you think this is a good idea, want to come on the ride or help out on the day. And stay in touch as I finalise details. This entry was posted in Historical, Present and tagged community, cycling, events, Moondyne Joe's. Bookmark the permalink.